You are about to start your first day of school, and you’ve got the jitters. Do you have the right textbooks? Will you remember how to log into your student account? Will you remember your teachers’ names? These are all normal concerns, but they might not feel that way since you’re going back to school as an adult. 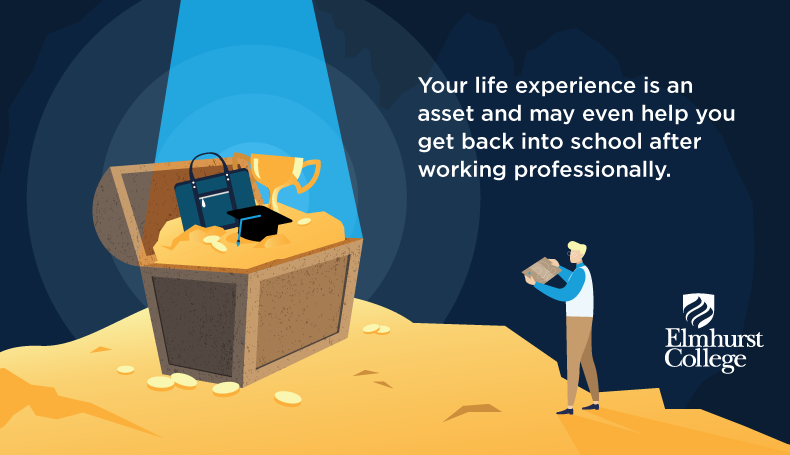 Returning to college after years of professional work can be more nerve-racking than the first time around, but it doesn’t have to be. What do you want to gain from your return to college? Do you want to switch careers? To get a promotion? Or some other achievement? Use this answer to guide your school experience. If, for example, you want to switch to the accounting department at your current job, save your electives for finance and mathematics rather than management and organization. If you don’t know which courses will best help you achieve your goals, consult your program director. Most applications include a written portion asking you to explain why you want to return to college or why you’d be a good fit for the school. This is a great opportunity to weave in your professional experience. Don’t be afraid to brag! List your accomplishments (especially if they’re applicable to your chosen program), and explain how the school you’re applying to best relates to your prior work. Your experience is an asset and may even help you get in. Once you’ve enrolled, look through your list of required classes to see which ones best reflect your prior work and future goals. What you’ll learn can—and will—relate to your professional life. If you have time before school starts, do a little reading on the most relevant subjects or browse through lectures created by your instructors. If one of your professors wrote a book, read it! If you plan to keep working while going back to school, an online degree or part-time enrollment can help you manage your time best. Some schools and programs, like Elmhurst College’s Master of Business Administration, are available as part-time, online degrees. Choose the option that works best for your lifestyle. Excited? Check out Elmhurst College’s list of graduate programs to see which might be best for you! Complete our form to request more information!